Spencer Monks' Reserve Ale (ABV 10.2%) is a fragrant, robust and full bodied Quadrupel, mahogany in color and crowned with a dense, tan, frothy head. Its malt-forward profile yields to a warm finish. The recipe development phase stretched over three years and 13 experimental brews. 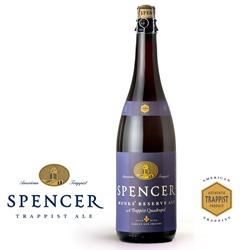 The Spencer monks sought an alternative to the use of spices for flavor enhancement by pushing the boundaries of traditional Trappist Quad malt profiles, even incorporating some local barley grown in nearby Barre, MA which was craft malted in Hadley, MA. The outcome is a unique product with a distinct flavor profile well situated within the Trappist family of Quadrupel ales. 25.4 oz. corked bottle. My husband loves trying new beers and I wanted to find something special for his 50th birthday. This was it! Years (like a million years ago) when I was in college I visited St. Joseph's Abbey. I heard they had started making beer and had been on a mission to find it. My husband was thrilled with the "instructions manual" that came with the beer. Well packaged, great bottle. Big hit! Jul 12, 2018 | By david c.
Apr 8, 2018 | By TOM H.
As with all Spencer beers that I've tried, it is a wonderful beer.